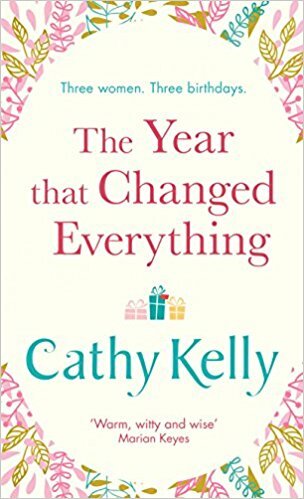 ‘The Year That Changed Everything’ is the latest book by Cathy Kelly. Ginger isn’t spending her 30th the way she would have planned. Tonight might be the first night of the rest of her life – or a total disaster. Sam is finally pregnant after years of trying. When her waters break on the morning of her 40th birthday, she panics: forget labour, how is she going to be a mother? Callie is celebrating her 50th at a big party in her Dublin home. Then a knock at the door mid-party turns her perfect life upside down . . .
Cathy Kelly is back with another tale of female friendships and complicated relationships that made for bittersweet reading. In her latest book, we meet three very different women who all share one significant date in their lives. On the day before Ginger’s 30th birthday, she discovers that the people who she thought were her best friends, weren’t her friends at all. Hurt by the way she’s been treated, she sets herself a mission to make her life happier and too rid her life of all the toxicity in her life. Callie is a modest woman with small demands, she’s the opposite to her husband, Jason, who loves to flash his cash around, but it seems that flashing all that cash has gotten him into trouble leaving Callie and their teenage daughter Poppy to deal with the consequences. Meanwhile, after years of trying to have a baby, Sam and her husband Ted finally have a little girl to add to their family unit, but with having the least maternal mother in the world as a role model, Sam fears that she’s unable to be a proper mother. I really enjoyed this story, it reminded me of a Maeve Binchy novel, a story of friendships and relationships and the issues that women face on a regular basis such as post-natal depression, deception as well self confidence and body issues and Cathy has written about them all in her book, in a frank and charming tale with an injection of Irish wit from the vibrant characters scattered throughout. The book is filled many different roles from all walks of life. All three leading ladies are wonderful and with all them I felt an immediate connection with, particularly Ginger. She’s a kind, big hearted woman that people take for granted especially her friends and it makes for sad reading, when she’s confronted with how they really feel about her. But instead of wallowing in self pity, she takes on their criticism to use it to make a change to her life for the better and use it to achieve her goals and find love. Callie, has become used to being a kept woman but quickly adapts to change when she finds that the life she she has been living was based on a lie and does everything in her power to protect her moody teenage daughter. And for Sam, I felt a strong empathy for, as she struggled with being a new mother and adjusting to her life and constantly judging herself. The book is written from the different perspectives of the women, but they flow seamlessly together as the women’s lives begin to interact and their bonds begin to grow. Wonderfully written, filled with compassion, charm and delicious characters, ‘The Year That Changed Everything’ is an inspirational story of life and change and truly goes to show what a difference a year makes. A charming tale! You can buy The Year that Changed Everything from Amazon and is available to buy from good bookshops.